Do you ever find yourself overwhelmed with the day to day tasks set forth by work, and your personal life, so much so, that you simply forget to grab dinner on the way home? Or maybe you just don’t have time to prep, cook and plate a balanced meal for the ones you love? No worries– now you can have your meals prepared and on the table in 30 minutes, with Kitchen Surfing, an online service that provides a personal chef for your and your family. Kitchen Surfing caters to every type of dinner from ordinary weeknight meals to formal dining soirees, to girls night cocktail parties; at prices ranging from $25- $100 per person with an $25 gratuity fee included in your total cost. This service may be great for holidays, baby showers or just those nights where work and life prevent you from dragging out those much loved pots and pans– and they even take care of the dishes. The process seems fairly simply. First, you decide what type of meal you would like to order and which meal you want to try, choosing from three daily specials, which include diet specific options. Menus serve two to six people and are prepared daily. The food appears to be healthy and fresh, with today’s menu options being chicken tacos, Greek branzino, or homemade papardelle with roasted mushrooms and salad. Next, you have the option to “book for tonightâ€ or to plan ahead and schedule a meal for later in the week. Chefs are available seven days a week and supper can be scheduled every hour from six to nine. Imagine walking in to a home cooked meal and the dishes already done. If you’re lucky enough to have a doorman, you can leave your keys for the chef or have the doorman let the chef into your home and according to their website, these personal chefs you can trust, show up prepared with equipment, cook, serve and clean up in just 30 minutes. 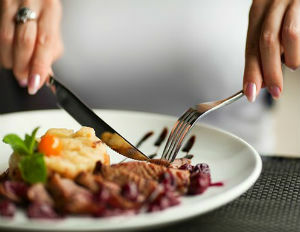 Unlike other services such as Send a Meal, which delivers chef a crafted dinner to your door, or Plated, where the fresh ingredients are delivered and you prepare the meal on your own– Kitchen Surfing believes in the freshness and quality of cooking on the spot and you also don’t have to lift a finger. The service is currently available in New York,Boston, Chicago, Los Angeles, Seattle, and Washington DC. To stay in the loop, you can sign up to receive daily Kitchen Surfing menus, letting you know what’s good for the day and to share the love, $25 gifts are available to purchase for friends and family–giving them a discounted first meal. The service has several five star reviews on Yelp, earning them a four and a half star rating overall. To learn more about the service that helps you to balance your life, meals and budget, visit KitchenSurfing.com.